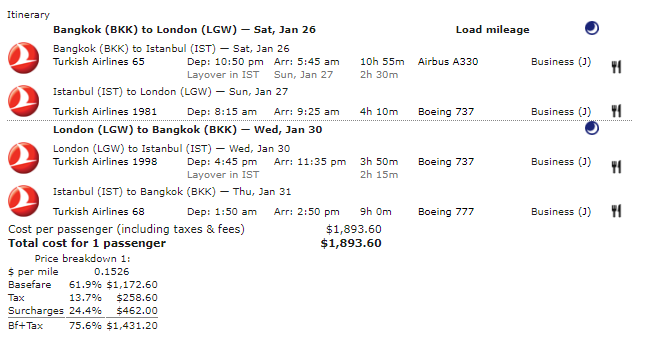 Today’s Airfare of the Day goes to Turkish Airlines and their business class promotional round trip fares between Bangkok and London. Fare: Turkish Airlines (TK) JF2BRO BKK to LON. Price: from $1,886 ($1,173 base fare + taxes & surcharges). Advanced reservation/Ticketing restrictions: reservations are required for all sectors. Ticketing must be completed at least 7 days before departure. Minimum stay requirements: travel from last fare break outside country of fare origin must commence no earlier than 3 days after arrival at the first fare break outside country of fare origin or – travel from last fare break outside country of fare origin must commence no earlier than 1201AM on the first SUN after arrival at the first fare break outside country of fare origin. Maximum stay requirements: travel from last stopover must commence no later than 12 months after departure from fare origin. 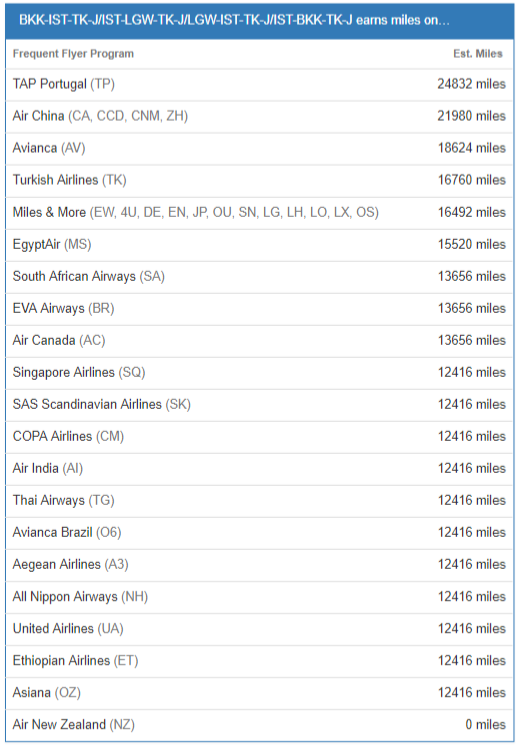 Stopovers: unlimited free stopovers permitted on the pricing unit. Transfers: 4 free transfers permitted on the pricing unit. Travel restrictions: valid for travel commencing on/after 18SEP 18 and on/BEFORE 30APR 19. Sales restrictions: Tickets must be issued on/before 20SEP 18. Tickets must be issued on TK or HR. Changes: charge USD 130.00 for reissue/revalidation. The following accruals were estimated using wheretocredit calculator for BKK-IST-LGW travel on TK marketed and operated flights without considering any elite status bonuses or ongoing promotions. Next articleMarriott / SPG Platinum Elite Amenity: Breakfast vs Mediocre Points Credit – What To Choose?